Ruby is a thief-in-training and a keeper of secrets—ones she doesn't even know herself. A Riddle in Ruby is the first book in a witty and fast-paced fantasy-adventure trilogy for fans for Jonathan Stroud, Septimus Heap, and The Very Nearly Honorable League of Pirates. Ruby Teach, daughter of a smuggler and pirate, has been learning how to swindle and steal and pick the most complex locks for as long as she can remember. But a collision with aristocratic young lord Athen sends her spinning into chaos. Little did she know that her whole life has been spent in hiding from nefarious secret societies and the Royal Navy . . . who are both now on her trail. In this debut middle grade adventure, Kent Davis weaves a rip-roaring tale through an alternate colonial Philadelphia. A world where alchemy—that peculiar mix of magic and science—has fueled the industrial revolution. With this highly original setting, a cast of fully rounded characters and rapid-fire, funny dialogue, A Riddle in Ruby will call to mind fantasy greats like Diana Wynne Jones and Terry Pratchett. 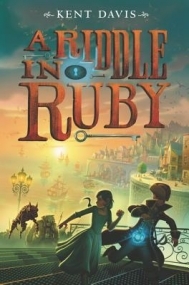 While I was initially intrigued by the premise for A Riddle in Ruby, I did not expect to it to be so completely fascinating and cool. Alternate histories are an interesting concept, and I love the focus on colonial Philadelphia for this one. There are mixtures of the Royal Navy, pirates, magical chemistry (or chemical magic, depending on how you look at it), and societal struggles. Kent Davis does a masterful job at world building in this first book while still leaving more to be discovered in the next. The writing in general is so smooth and fast paced that I had a hard time putting this down. The action is nonstop. It seems that Ruby can never find a fully safe place, one with answers and comfort, so her, Lord Athen, and Cram are continuously moving around, and none of them really have a solid idea of what everyone wants with Ruby. The mystery and suspense makes the plot go even quicker, and though this is a longer novel, it is easy to get lost in the pages, holding your breath until you find out if the characters are safe. For the most part, I absolutely love this story. I love the fierce and questioning characters, the mixture of magic and science, and the unending adventure. However, there are one or two plot twists that feel a bit random (especially Lord Athen’s identity). Sometimes, the story would seem to hint at an issue or topic, but then it never resurfaced. Of course, this may be explained or examined further in the series, so this certainly didn’t stop my high praises. Fast action, complex characters, and a dazzling and dangerous world make A Riddle in Ruby one of my favorite reads of 2015. Kent Davis writes remarkably, and I can’t wait to read more from this incredible author and discover the further riddles of Ruby Teach.